A single striking sapphire and two adorn diamonds accent this Sapphire Diamond Art-Deco Style Ring, 14K White Gold in timeless and sophisticated fashion. The influence of the 1920s is clearly seen in this classy style as the clean lines and strong shapes of the setting perfectly offset its sparkling stones. 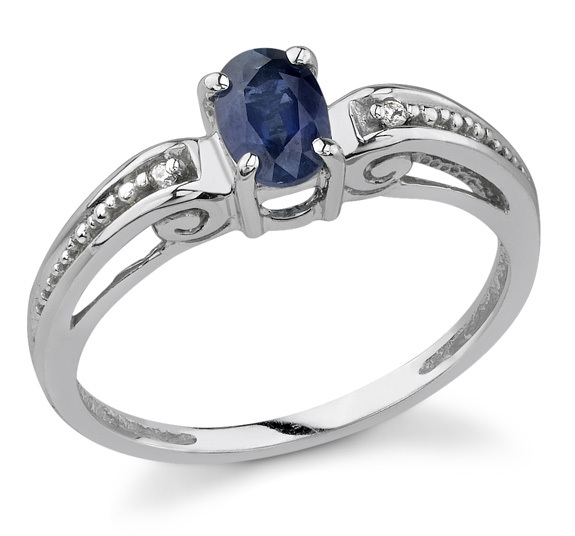 The sapphire that stars in this Art Deco ring is an oval-shaped stone, 6mm high and 4mm wide. The rich blue hue of this classic precious gemstone is instantly alluring and timelessly glamorous, with a saturated sparkle that's been winning it admirers for millennia. This richly-colored gem is accompanied by two small round diamonds, one channel set on each side of the center stone. These colorless glittering accents beautifully complement the dark hue of the sapphire, while providing an extra little boost of sparkle to this already eye-catching ring.